Humans are acclimating to higher temperatures on Earth, according to a study co-led by Kristie Ebi, a University of Washington professor in the School of Public Health. The findings suggest that people can adapt to gradual increases in average temperatures, though whether that adaptability can be sustained with the advance of climate change is yet unanswered. 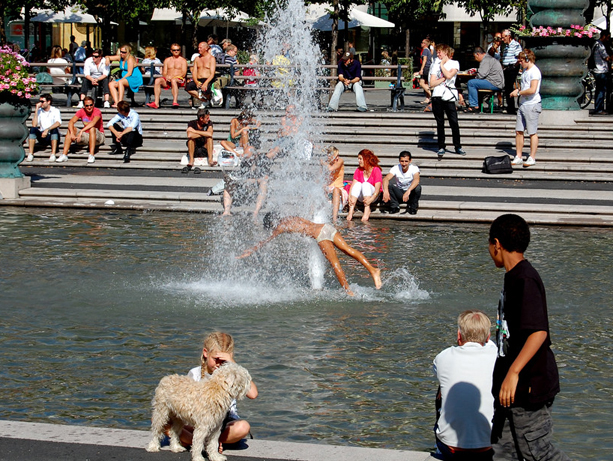 This study, published in Environmental Health Perspectives, used daily mortality and temperature data from Stockholm, Sweden, from the period 1901-2009, the first such study of those data that spanned more than a century. Ebi worked with researchers from Sweden’s Umeå University, where the study was conducted and where she is a visiting professor. They investigated whether the temperature at which mortality is lowest in a particular location, or minimum mortality temperature (MMT), has changed as the global mean surface temperature has increased. Evidence shows that there is a shift to more days with higher temperatures and fewer days with lower temperatures. Extreme ambient temperatures, hot or cold, are known to negatively affect human health, the study noted. Over the study period, housing standards improved with the introduction of central heating and more sanitary conditions. People died at older ages and life expectancy increased. Virtually all who were able and willing to work became employed, which led to greater economic security. Also, the per-capita gross domestic product increased substantially. These changes yielded large benefits to public health. Acclimatization within the context of these epidemiological, demographic and societal changes offset some of the mortality from higher temperatures by shifting the MMT to higher values, the study found. MMT varies greatly across countries and regions, according to the study. MMT can range from a daily mean temperature of 50-54 degrees Fahrenheit in Scandinavian countries to 80 degrees Fahrenheit in Miami, Florida.